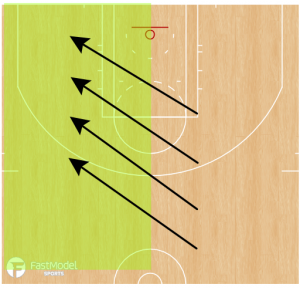 This ideas was contributed by Randy Sherman to the FastModel Sports Basketball Plays and Drills Library. Coach Sherman s the owner and founder of Radius Athletics – a basketball coaching consulting firm – where he consults with basketball coaches at all levels on coaching philosophy, practice planning, Xs & Os and teaching a conceptual style of basketball. 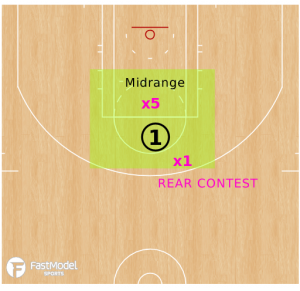 This post is to provide an idea to consider using in certain situations and against certain players as a part of the way you cover on ball screens. It is not meant to say that this is the only way you should defend ball screens or that it is right for every team at every level. As a coach, you have to make a decision as to whether or not it applies to your situation. “Tilting” the offense to the left side of the floor and forcing players to use non-dominant hand in ball screens…. 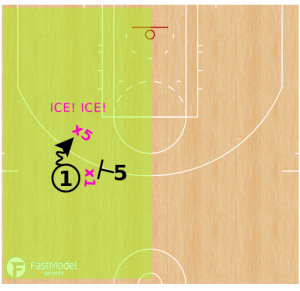 Therefore, on any ball screen on the left side of the court we ICE the ball screen. Forcing them away from the screen makes the ball handler use left (weaker) hand. X1 goes over the screen. 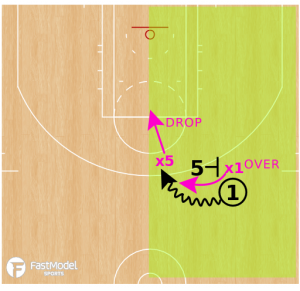 X5 provides a flat hedge and gives ground (drops) as dribble attacks. Keep an eye on the second hand of the dribbler touching the ball. That’s when you must contest the pull up. Ball handler is attacking with left (weaker) hand and giving cushion baits him/her into the midrange two off the dribble. By dropping, we’ve induced Player 1 into the midrange pull up.